A composite liner takes the same concept as the flat sheet liner and allows it to conform to more complex shapes where a standard flat sheet would result in significant wastage. Composite liners allow you to design a feature with streams and ponds all on the same level and not waste money on material that is not required. Also, when designing large ponds or irregular shape, a composite liner can save substantial cost by conforming to the shape of the pond. 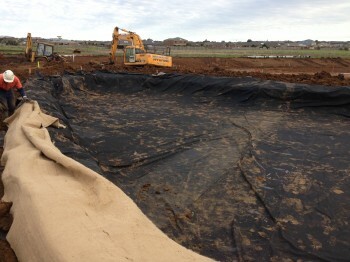 Measuring for a composite liner has to be done once the excavation has been completed. As a result of this, and the added complexity in manufacture, the construction of a pond using a composite liner will take more time than with a flat sheet.